Miami Dolphins fourth-yearÂ wide receiver Brian Hartline, as well as CEO Mike Dee, held a conference call with the teamâ€™s season ticket holders tonight, and DolfansNYC had the chance to listen in on their thoughts and expectations with the 2012 season on the horizon. Over the course of his career, Hartline has caught 109 passes for 1,670 yards and five touchdown passes in 44 games (23 starts). The Ohio State product’s 15.32 yards per catch ranks 15th among all WRs with at least 100 receptions over the last three seasons, ahead of Miles Austin, Hakeem Nicks and Andre Johnson. 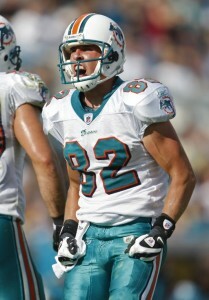 During the 40-minute call, Hartline discussed a wide array of topics, including the unique way in which he mastered tip-toeing the NFL sidelines and which Dolphin he’d pick in the first round of a fantasy football draft. *No. 82, who recently underwent an appendectomy, stopped short of calling himself 100 percent ready to go, but said his rehab from the surgery has gone well. *Hartline expressed confidence in the team’s coaching staff, including offensive coordinator Mike Sherman, and explained the West Coast offense relies on quarterbacks and wide receivers being on the same page. *Hartline reiterated several times that he anticipates carrying a large role on offense and being used all over the field, and revealed his personal goals are to be a veteran leader on a young team and to hit a major milestone. “Most of my personal goals revolve around the team,” he said. “I firmly believe that if you win football games, you play at a high level, the rest of it takes care of itself. *Hartline believes that other teams with rookie quarterbacks are not as fortunate as the Dolphins, who have two talented veterans capable of carrying the load until Ryan Tannehill is ready, but confirmed that if the eighth overall pick shines in training camp, it won’t be long until he is named the starter. “You’re going to play the best guy, and if (Tannehill) really does separate himself and he’s the best guy, then he’s going to play the game,” he said. *Hartline said the coaches have a very difficult decision to make on the Week 1 starter, which he expects to come towards the end of training camp in order to give the players a chance to work on their timing and communication. *Hartline acknowledged that while the NFL is a team sport, he has taken some of the criticism the Dolphins WRs have faced in the media on a personal level, and believes the underrated corps will change the negative perception. “I know what I think of our guys, and I’m impressed with where we’ve come to where we’re at now,” he said. “Definitely, I feel like thisÂ is the best overall group we’ve had. *Hartline said that Chad Ochocinco Johnson brings knowledge, experience and familiarity with a lot of defenses, and will help the young receivers react to different schemes. 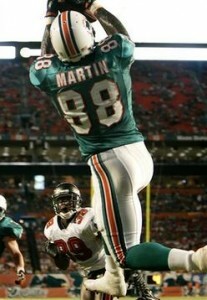 *Hartline said the two players who have the most break-out potential are fellow WRs Julius Pruitt and Roberto Wallace. 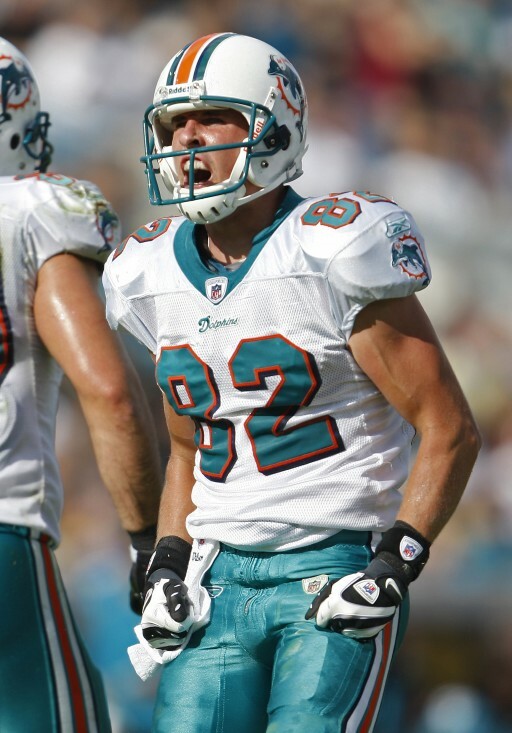 *One of Hartline’s most interesting answers came when he was asked about how he learned to tip-toe the sidelines and make his patented spectacular down-the-field catches. Barely 72 hours later, it still feels surreal. 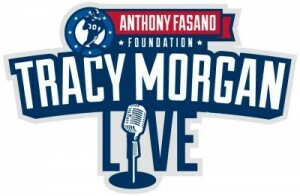 Michelle and I, along with a couple of our friends, had the opportunity to go to a Tracy Morgan charity comedy show in Miami, which was presented by Dolphins tight end Anthony Fasano to benefit Veteranâ€™s Housing. Thanks to the event organizers, Lunar Sports Group, we had invites to the pre-show VIP party, backstage passes and tickets to the after-party at the Shore Club. We were informed beforehand that several of Fasanoâ€™s teammates could come out for the show, and sure enough, Reggie Bush, Davone Bess, Brian Hartline, Jared Odrick, Clyde Gates, Steve Slaton, and ex-Dolphin Lousaka Polite were among a dozen or so players in attendance. Michelle and I volunteered to check-in the VIP guests, meaning we had to put tiny orange bands around the massive wrists of professional football stars and the tiny wrists of their supermodel girlfriends. It was a tough job, but someone had to do it. Once the pre-show party concluded, the players and VIP guests were ushered down the hall, where Morgan came out to welcome everyone to the show. Well, he didnâ€™t so much welcome them, as much as launch into an impromptu stand-up act, explaining that heâ€™s the sole reason why both the NFL and NBA lockouts had ended. Thatâ€™s probably the one part that I can repeat with a straight face, much less reprint here. Â Letâ€™s just say the majority of his topics had a lot to do with bodily functions and bedroom acts most people would probably never want to try. Morgan walked up and down the hall, cracking everyone up with his unique sense of humor, driving home the point that absolutely nothing and no one was off limits (more on that shortly). Before he went back to his dressing room, I made sure to shake his hand and tell him how much I enjoy his work, figuring it would be my one chance to speak to him. The Dolphins walked to another section of the theater to pick up food and beverages before the main act, where MiamiDolphins.com beat writer Andy Kent introduced us to Bess, Michelleâ€™s favorite player. Bess was extremely nice and personable, openly talking about Miamiâ€™s heartbreaking last-second loss on Thanksgiving, and taking the time out to pose for pictures. Michelle was star-struck and giggling in delight after Bess walked away â€“ pretty much exactly how Iâ€™d react if I ever talked to Candace Parker. As for Morganâ€™s actual stand-up, he began the routine by pulling no punches about Bushâ€™s relationship with Kim Kardashian and her E! reality show, and continued to spew (heh) unfiltered raunchiness and crudeness for the next hour-and-a-half. I donâ€™t think thereâ€™s a person on earth who can get away with anything he said or make such absurd topics so hilarious. My face actually hurt from laughing so much. Soon afterwards, we walked several blocks to the Shore Club, where none other than Tracy Morgan and a few of his friends sat on a bench outside, with no bodyguards or bouncers in sight. When he saw us, he dove right back into his comedy act, telling us a few jokes he forgot to say during the show. At one point, he said (Iâ€™m paraphrasing for language, clearly) that men can’t live with or without women. Â Michelle laughed and told him I was learning all about that. â€œNah, heâ€™s a good boy,â€ said Morgan. â€œHeâ€™s domestically trained, like me. He knows not to pee inside the house.â€ I canâ€™t argue with this. He then asked us if we were coming inside (as if weâ€™d miss it for anything), at which point one of his friends told Morgan that I look like Jesus. â€œHeâ€™s got the long hair, the beard â€“ all heâ€™s missing is the sandals,â€ he said. Morgan took it a step further, declaring that I actually look like Mosesâ€™ mother. I still have no idea what to make of that, but it was fantastic. He then asked me if Iâ€™d seen the originalÂ Planet of the Apes, and for whatever reason, I told him I hadnâ€™t. It didnâ€™t matter â€“ he went right into a Charlton Heston impression from some movie none of us knew; regardless, we laughed hysterically. Inside the club, I spotted one of the comedians who opened for Morgan and had to get a picture with him, obviously because of that amazing mustache. Somewhat disappointingly, his act barely mentions the sweet â€˜stache, with just one quick line about Super Mario being on stage. We hungÂ Â around in the back for a while, where some of the guests played pool and hit on scantily-clad women, and went home around one thirty in the morning. After spending some time with him, I can safely say that Morgan basically plays himself inÂ 30 RockÂ (within the confines of network television, of course) â€“ an outrageous and unpredictable character whoâ€™s always on and lives for making others around him laugh. Needless to say, it was an unforgettable experience with the hands-down funniest person Iâ€™d ever met. 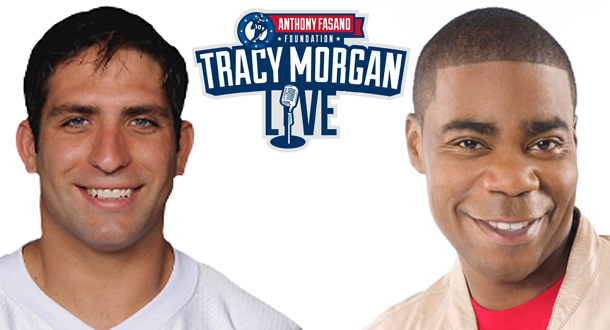 Dolphins TE Anthony Fasano joins us to discuss hosting his upcoming charity comedy show featuring actor Tracy Morgan; analyze Miami’s three-game winning streak; and share his thoughts on DolfansNYC.Â Anthony leads the team in TD catches (four) and ranks fourth in receiving yards (258) on the season.Â To learn more about the Anthony Fasano Foundation, visit the official website. 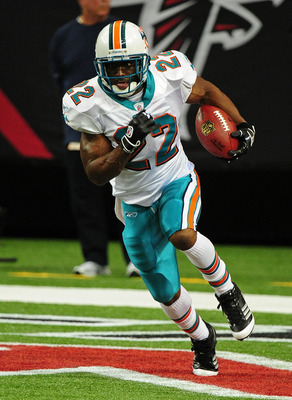 Subscribe to theÂ DolfansNYC Podcast on iTunesÂ and get all future episodes. Subscribe to theÂ DolfansNYC Podcast via RSS. 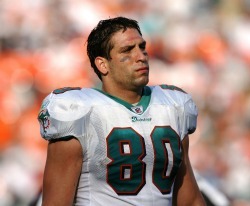 As many of you know, Dolphins TE Anthony Fasano, who’s scored three touchdowns in Miami’s last three games (all wins!) is hosting a charity comedy show headlined by Emmy-nominated actor Tracy Morgan (30 Rock, Saturday Night Live) on Saturday, November 26 at 8:00 p.m. in Miami, FL. Proceeds from the event will benefit the nonprofit organization, Rebuilding Together: Veterans Housing. You can use the discount code “touchdown” on the payment page to receive 15% off each ticket. For every ticket purchased, you will receive an autographed Anthony Fasano photo. In addition, you will be entered into a drawing with fellow DolfansNYC members to receive passes to the VIPÂ pre-show meet and greet with Anthony and his Dolphins teammates at the The Fillmore. Â The winner will receive as many passes as tickets purchased. In order to be eligible, simply forward us the confirmation email following the purchase of your ticket(s). Donâ€™t miss out on an exciting opportunity to see Anthony take the stage and help raise money for a worthy cause. Dolphins TE Anthony Fasano, who caught two touchdown passes to lead Miami to a victory over the Kansas City Chiefs on Sunday, will host a charity comedy show headlined by Emmy-nominated actor Tracy Morgan (30 Rock, Saturday Night Live) on November 26 at 8:00 p.m. The event will take place at The Fillmore Miami Beach at the Jackie Gleason Theater, with proceeds benefiting the nonprofit organization, Rebuilding Together: Veterans Housing. Don’t miss out on an exciting opportunity to see Anthony take the stage and help raise money for a worthy cause. Tickets can be purchased here, with special VIP tickets including a pre-show meet and greet with members of the Miami Dolphins. The Anthony Fasano Foundation is a nonprofit organization that supports children and families affected by Autism. Anthony has hosted his annual Golf Classic, which benefits the REED Academy, and Bocce Tournament, which provides Â impoverishedÂ families with food during the holidays, for the last four years. Last week, DolfansNYC attended Web Weekend, an annual event hosted by the Miami Dolphins for the team’s top fan websites. Prior to Sunday’s game against the Houston Texans, Coach Tony Sparano addressed the crowd and spoke about a number of key topics, after which we he took time out of his busy schedule to answer a few questions for our podcast. Below are the main portions from the group Q&A, followed by our exclusive one-on-one interview with Coach Sparano, in which he talks about his football playing career, the decision behind hiring offensive coordinator Brian Daboll, and his thoughts on New York and DolfansNYC. I think a guy that you should watch out for, predicated on what Iâ€™ve seen throughout training camp â€“ and I donâ€™t like singling any players out, as Iâ€™m sure you guys know â€“ Iâ€™ll tell you that Reshad Jones is a guy I would watch. Â Â This guy had 13 tackles (against the Patriots), and has had a really good training camp, has really good range and ball skills back there.Â I think heâ€™s a guy that could have a really good year as a young player for us. Iâ€™m hoping that Jared Odrick will continue to get better.Â He needs to play, and he obviously hasnâ€™t played in a long time.Â So, Jared would be a guy that I would say the same thing about. Â And then maybe a young guy like Daniel Thomas. The first thing we identify, is where the need is â€“ obviously, just because thereâ€™s a player out there, he might not satisfy our needs at that particular time.Â There were a lot of good players out there when free agency hit at the end of the lockout, but we had a particular plan in mind, knowing what we had coming back and knowing maybe a little bit about what we needed. This year, business was done a little bit differently, only because the draft was done before free agency.Â So, in the draft, we got to fill some needs like Clyde Gates, in getting speed, or Mike Pouncey, in finding a center, and Daniel Thomas, in finding a (running) back.Â At that point, it became, â€œokay, weâ€™ve got Daniel Thomas â€“ whatâ€™s the next piece?Â Well, thereâ€™s this Reggie Bush that might be out there.â€Â That was a scenario there where (it was) a hunch on our part, only because Reggie had made a lot of money where he was, (and could have been) a cap casualty.Â And we had all of those things â€“ our scouting department has a list of players that we think are going to be released, a list of players that are free agents, and potential cap casualties.Â And this was a scenario where we were able to get a good player in that situation and bring him to our team. But the way the process works, is identifying the problem first, then Jeff (Ireland) and I will sit down and go over the possibilities.Â Weâ€™ll have what we call a â€œshort list,â€ a list of players in that area, that weâ€™ll start putting together, weâ€™ll go through, and if we feel like thereâ€™s a chance that we can strike a deal with somebody there that might be a good deal for us, then weâ€™ll push towards that.Â So, itâ€™s mutual, both of us together, but most of the time, itâ€™s about me bringing a need first. No, no real thoughts about the Wildcats right now. The reason the Wildcat originated, was that at that particular time, we didnâ€™t have the personnel that we have on our football team right now.Â You look at Brandon Marshall, and Davone Bess, and Brian Hartline, and Clyde Gates, and Reggie Bush, and (Anthony) Fasano, and these types of people that you can get the football to â€“Â we didnâ€™t have that necessarily; we had Ronnie (Brown) and Ricky (Williams) at the time.Â So, (with) Ronnie and Ricky, how can we get them on the same field at the same time and maybe get the ball in their hands enough times? Â That was kind of the reason why we went with something like that.Â I donâ€™t know that the Wildcat is something that weâ€™re really too interested at this time. (After audience applauds) You werenâ€™t clapping way back when â€“ it was genius at that point. I would say that the biggest difference isnâ€™t necessarily in Chad â€“ the difference is in how the team perceives Chad.Â Chad is the same Chad that I know from the previous years.Â The difference is, if the lockout was good for anything from my end, as a football coach, the lockout was good because Chad had to be out there running these workouts on his own. Â He had the keys to the closet and he was the only guy that really knew about the offense, contrary to popular belief out there.Â The players needed him â€“ they had to come to him for the answers.Â So, in these player-only workouts that took place out there, Chad had all the answers for them, so obviously he got them lined up, he organized the practices, he did everything from that standpoint.Â So now, when Chad says something, it isnâ€™t, â€œwell, let me go find somebody else to get the answer,â€ itâ€™s, â€œI got it, Chad.â€Â At the quarterback position, he drives the bus, and at the end of this thing, it really sets on his shoulders.Â So he needs to have that respect, and I think that Chad clearly has the respect right now. Coach Sparano, in which he talks about his football playing career, the decision behind hiring offensive coordinator Brian Daboll, and this thoughts on New York and DolfansNYC. I ended up getting stuck in DC last weekend and watching the game with the DC fan club. I will take full responsibility for the loss because I left the bar at half time to watch the game at my parents house and we immediately got back into the game. I am pretty sure if I had not been cheating on you guys we would have won the game.Â My sincere apologies. Barring a miracle this Sunday will the the last DolfansNYC meet up for a while.Â We are planning two events for the off season including a draft party and another event that I don’t want to talk about until it’s finalized.Â We are going to be making shirts in the off season and should have those available online soon probably. I will talk about it more in the weekely email, but since this is probably the last game I hope everyone comes out even if there is not a lot of importance in this game. Clearly reaching .500 would be nice, but I want everyone to come out so we can say good bye for a while.Â There are so many awesome people I have met a Third & Long and I hope to see you guys all at least once more before the break. Anyway, since things are a bit depressing in Dolphins land I will leave you with something to hopefully cheer you up.Â It is a shout out from Anthony Fasano repping Dolfans NYC. 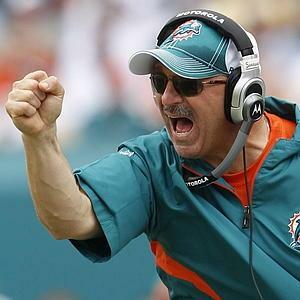 Fasano has been really with us and donated a lot of signed pictures for the raffles we have had this year.